The memorial of the citizens of Hancock County and its citizens in the State of Illinois respectfully represent that the navigation of the Mississippi River and the Des Moines Rapids is greatly disturbed by rocks, which render it not only difficult but very dangerous…Steamboats are often stuck on the rocks, their boilers have burst, several people’s lives have been lost and many others jeopardized…Above these Rapids, bordering on the Mississippi and its tributaries lies an extensive and fertile country, capable of supporting a dense population, much of it is yet beset by the general government and the value of which would be greatly enhanced by a free navigation. Add to this the lead in the country yet known. Immense quantities of lead annually pass over these rapids with a price levied upon it commensurate with the delays, difficulties and charges which have to be distributed… We therefore pray your honors to grant a sum of money to be applied in removing the obstruction in the Steamboat Channel on the lower or Des Moines Rapids and your memorialists as are duty bound shall be impressed with a deep sense of gratitude. The first signatory was Richard M. Young, followed by Cyrus Walker, Charles Robinson, J.L. Walker, and O. H. Browning. Other prominent landowners signing included Wesley Williams, Walter Bagby, Hugh White, Onias Skinner, Adolphus Allen and several others. In the adjoining state of Indiana, legislators were making serious plans for extensive internal improvements of their own as their General Assembly convened in December 1835. On February 19, 1839 the legislature established the Des Moines Rapids Railroad to be managed by eleven commissioners:[ii] These included: Mark Aldrich, Joseph Duncan, the former governor, Richard F. Barrett, Calvin A. Warren, Isaac Galland, Daniel S. Witter, David W. Matthews, John Montague, William D. Abernathy, Joel Catlin, and Isaac N. Morris. 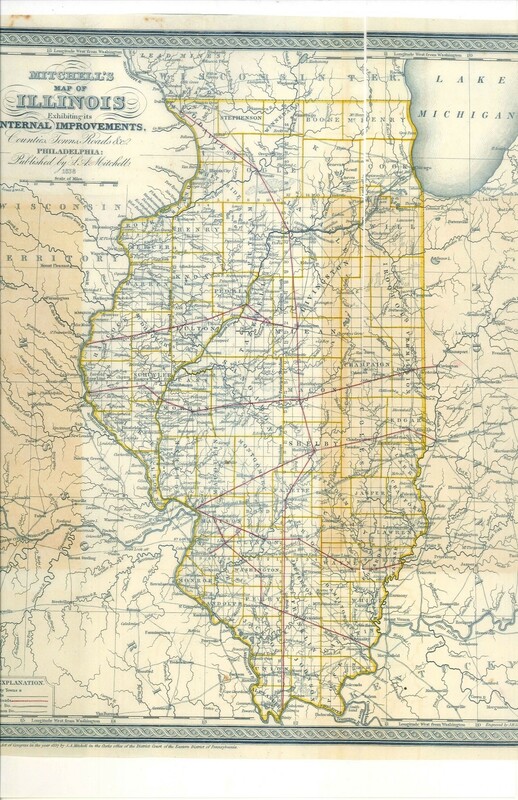 Aldrich, Duncan, Barrett and Warren were associated with the Warsaw Land Company and Morris was the President of the Illinois and Michigan Canal. In addition, Mark Aldrich was associated with Joel Wright as a fellow Warsaw Peoria Railroad Commissioner and who also served as one of the seven commissioners of public works. The leadership of the Warsaw Land Company benefited from the inside information of the state’s priorities and issues involved in all the improvement projects and in the details of the Illinois and Michigan Canal construction. In the nearby town of Warsaw, in the debut issue of their local newspaper, Western World, May 13, 1840 a quaint article was written entitled “Our Town and County”. The piece was extolling the anticipated benefits the town citizens could experience. Expectations were high that wealth was soon coming for the entire area from internal improvements. But what of the Mormons invading the area of the nearby town of Commerce? The proposed Railroad and Turnpike roads were still showing in Brown’s 1844 map. Both maps are in the possession of the author.